A new approach to religion appears to involve a bishop travelling from tavern to tavern to consume lots of ‘blessed booze’. A video published by tabloid Daily Sun has been generating a lot of comment online because it brings church to the last place most people would expect to find it: the local tavern. In the video, Bishop Tsietsi Makiti explains that he founded his new church and its novel approach about two months ago. In the video, tavern patrons/churchgoers are singing a song with the Sesotho lyrics “where do you want it”. While preaching to the congregants, the bishop explains that he’s planning on going to lots of taverns to present the word of God. He relays a story about how Jesus apparently came to earth, and upon arrival noticed that people were bored. So he supposedly told them to bring their traditional beers so he could pray over them. It’s unclear which part of the scriptures Makiti is basing his ministry on. 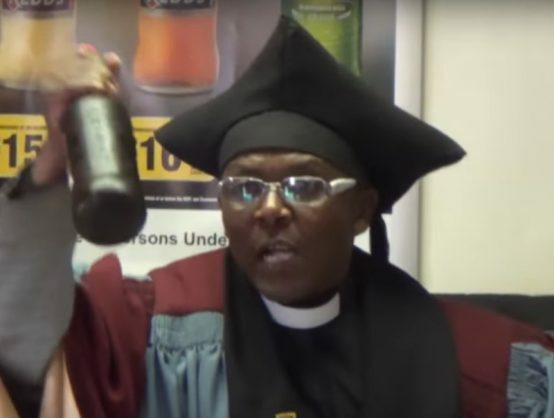 In the video, he tells his congregants to bring their beers so that he can bless them in the name of Jesus. While preaching, many of the men around him continue to take big swigs of beer. “Jehovah created heaven and earth so we can enjoy it!” Tsietsi declares at one point. Makiti explains the church was founded to welcome heavy drinkers who have been shunned by traditional churches because of their drinking habits. He says the church’s mission is to reach out to alcoholics and baptise them with their beverages of choice.